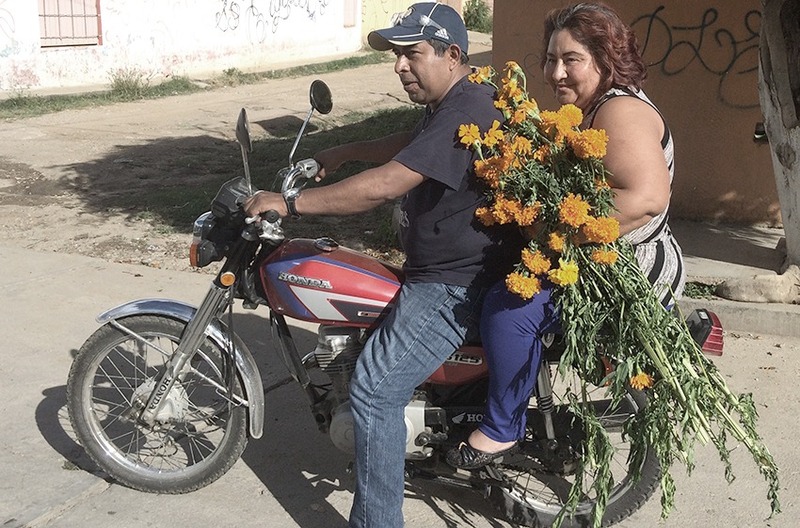 Arriving in Oaxaca, Mexico for The Day of the Dead after 8 weeks filming in the USA it felt as if we didn’t quite know how this stage of our journey would fit in to our Good Grief Project or indeed if it was part of the same film. Loss is loss and the death of a child seems to be no different here though the rituals that surround it are. 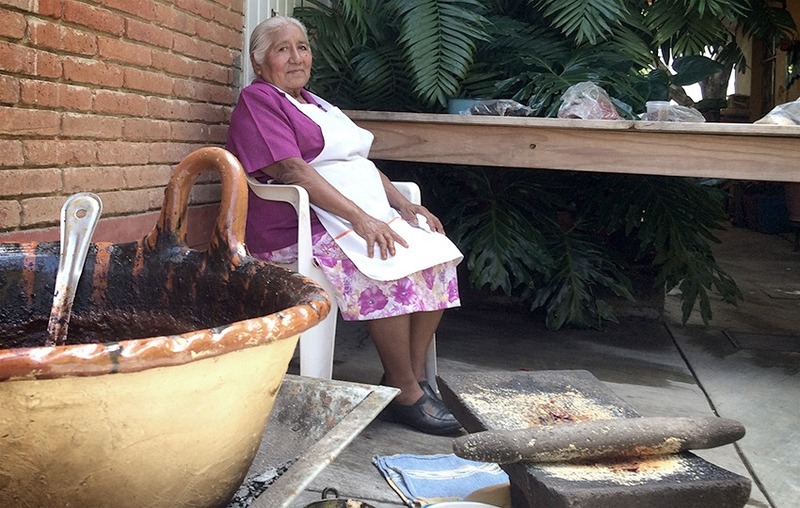 We are in the courtyard of the house she shares with her daughter Yeri as she prepares the traditional ‘mole’ a chocolate and chile sauce that is such a part of the celebrations of Day of the Dead. 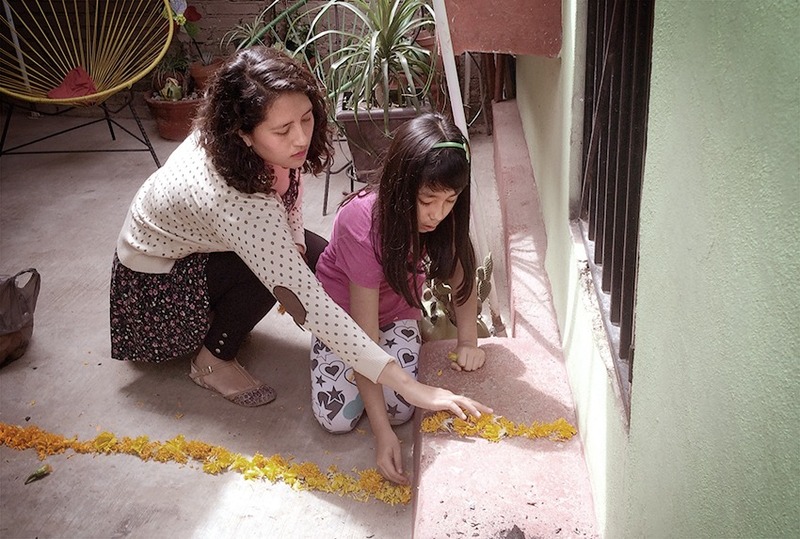 Sophia talked to us about how this annual event in which Mexicans wait for their dead to come back, allows her to reflect on her sons short life as well as to accept his death. A traditional and spiritual woman we were surprised and saddened to hear that she still believes she was responsible for her son’s death. She was only 15 when she entered into an arranged marriage and her firstborn died 2 years later. She was always treated badly by her in laws and is certain that her resulting anger had soured her breast milk and killed her baby. 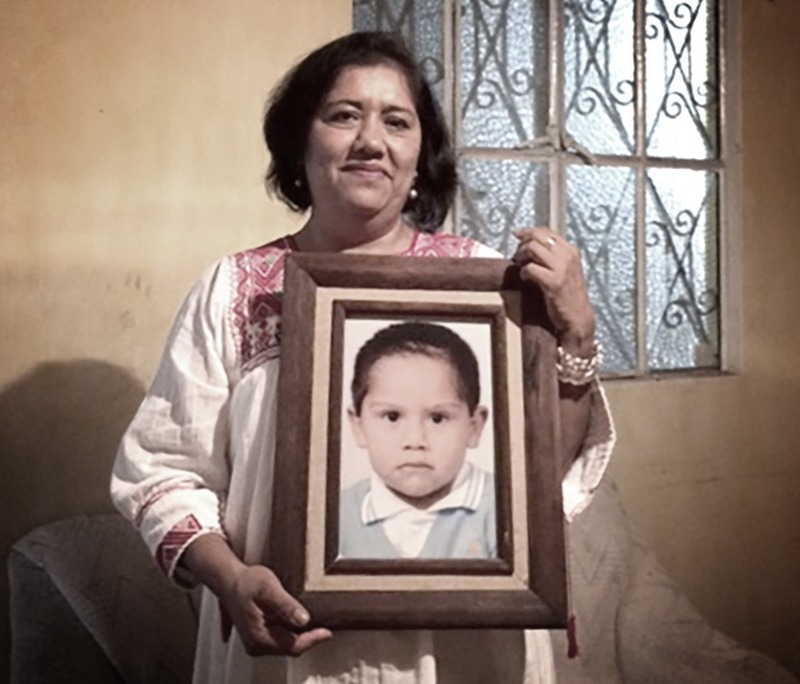 But that was nearly 60 years ago and the much more recent loss of her grandson, her daughter Yeri’s only son Santiago in 2012 had brought back the trauma of her earlier tragedy. Santiago was three years old when he pulled a drawer of a cabinet open which then fell on top of him. He died of his injuries two weeks later in hospital. 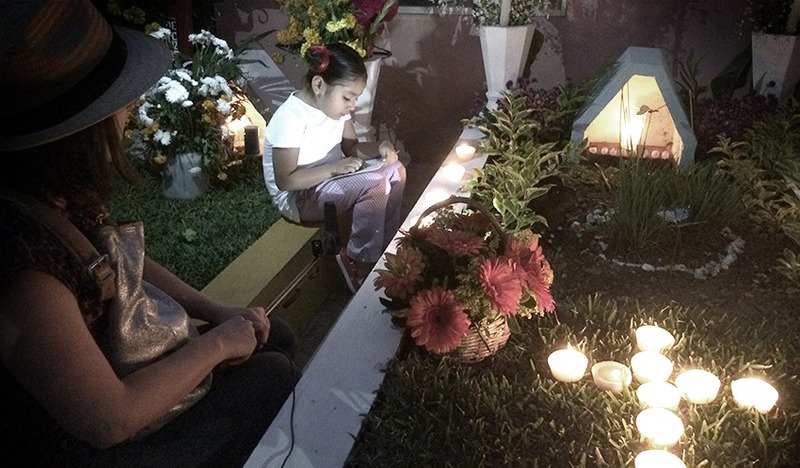 With her heart broken, Sophia and the rest of Yeri’s family took turns to sit and watch over her as they were scared she would take her own life. 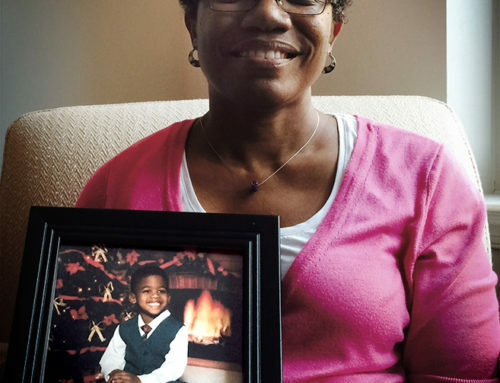 Death and grief are frequent visitors in this family but they have strengthened relationships rather than weakening them. Yeri talked of her mum Sophia as a matriarch without whom she couldn’t have coped. 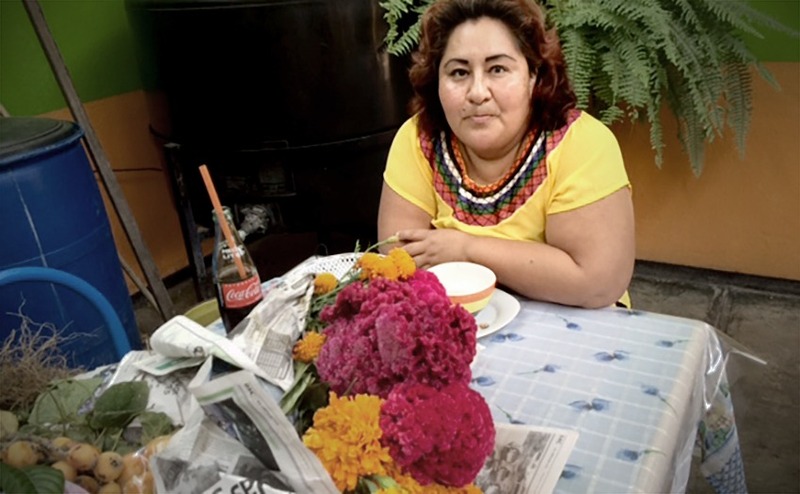 As she places chocolate and treats on her alter for Santiago Yeri tells us tearfully that The Day of the Dead is such an important part of her healing. The tradition reflects the belief that death is about life and is a natural part of the human experience. The dead are not lost forever and return to visit once a year. She asks if I can feel Josh’s presence. I feel deeply emotional and reply that he is in both my head and my heart and that we feel honoured to be here at this special time. 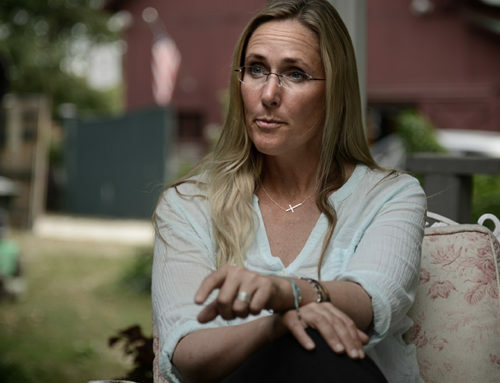 I also feel envious of her certainty that her son would be back if only for 24 hours and think how much I would give to spend just one more day with Josh. Outside of her family Yeri didnt know how to talk about her grief and felt the need to join a support group for bereaved parents called Renacer something akin to The Compassionate Friends in the UK and USA. 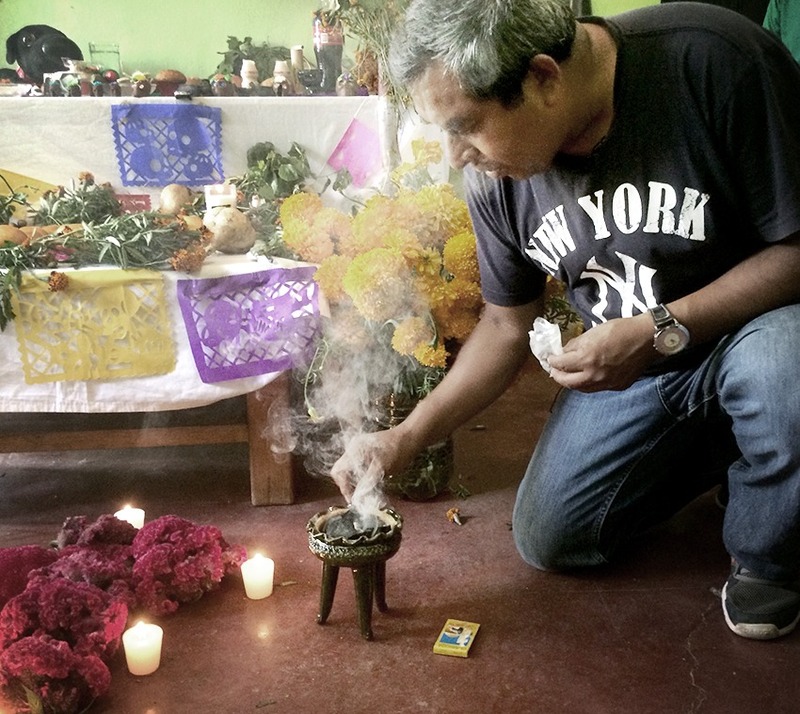 Even in Mexico with the exception of the celebrations of Day of the Dead there is a social taboo and discomfort about child death. It was at Renacer that Yeri met Marlene and Juan who lost their only child Sebastian in 2007. They became close friends. Sebastian had died age 8 after being diagnosed with cystic fibrosis as a baby. He had suffered terribly, as they had. His organs failed and his lungs collapsed and though shattered and distraught when he died they both felt relief that he no longer had to suffer so terribly. Juan and Marlane talked to us about the difficulties in their marriage. She had closed down, began hearing voices and taken to her bed. She was sedated for 20 days under threat of being sectioned. Juan returned to work and the chasm between them widened until they realised they needed to do something to save their marriage. It was at this point that they had joined Renacer where they gained a perspective on how husbands and wives grieve differently. No different than for bereaved parents in the UK. As they too prepared their alter for their son Sebastian Jimmy and I caught each others gaze as they invited us to place a photo of Josh on their alter. Their wish to include us in this ritual seemed to matter as much to them as it did to us. While Juan hugged her he told us that all relationships need to be worked on and that theirs would surely have collapsed if they hadn’t faced their difficulties. Relatives started arriving at their door. Sebastian’s cousins knelt on the floor laying a trail of petals. The scent of the marigolds would help him find his way home for the short 24 hour reunion. 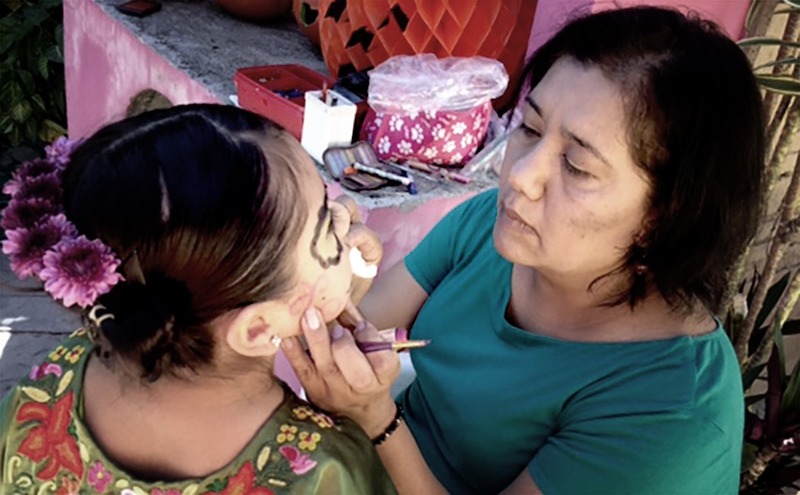 That evening we were invited to attend Renacer where we were embraced wholeheartedly as Oaxaca partied around us, sharing tears, memories and a lot of laughter with other bereaved parents and siblings. As we added photos of all 30 children we had brought from the UK to the altar, Cezar a sibling who had lost 2 sisters in a car crash and nearly died himself, read out all their names alongside the Mexican dead. So many stories of lost futures and broken hearts healed through ritual, time and most importantly peer support. 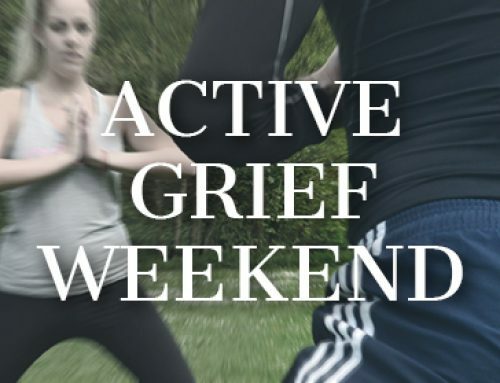 The underlying belief here that you don’t get over the death of your child but that you do learn to live with it, that there is no such thing as closure and that ritual helps. As always we would love you to post your comments and thoughts here. Thanks for reading. It’s been one heck of an experience and we can’t wait to launch our documentary next year. I have been thinking of you, wondering how you are getting on. 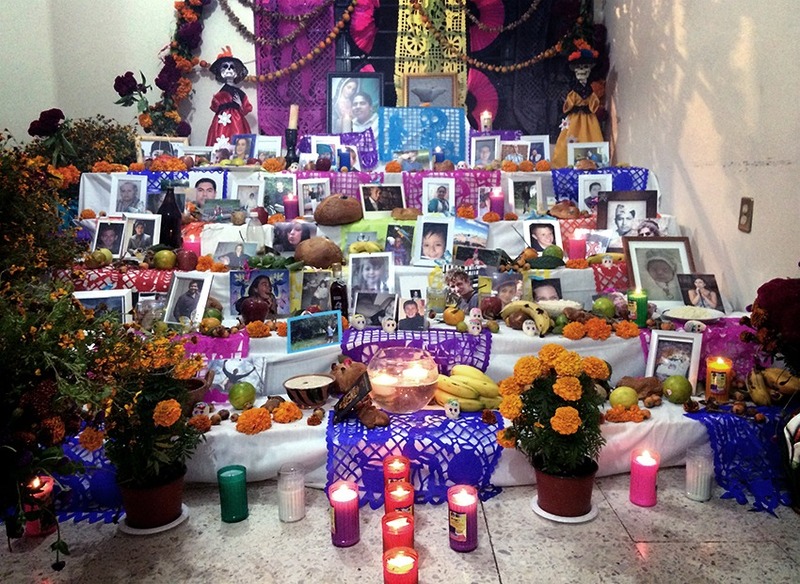 I especially thought of you on the Day of the Dead – what an amazing celebration and remembrance ritual. Your beautifully written posts brought it all to life – the highs and lows of your extraordinary trip. The questioning and self doubt, the overload and the physical exhaustion. You are doing an important difficult thing requiring so many skills and such endurance. But you two have it… and you kept going. I hope you can relax now and enjoy a break. Don’t worry. We will all watch and benefit so much from the film. We know that you never get over the death of your child though you do learn to live with it. It’s been liberating to be with families in Mexico and in U.S who understand this and can talk about it . It takes the pressure off them – and us – simply accepting that’s how it is. Rules, certainty and projections are seldom helpful. There does seem to be a change in the air though and we are glad to be part of that. So true that grief is the price you pay for love and that’s ok. And we are just fine. It touched us so much that so many parents wanted us to take their children with us on our journey. Thanks for trusting us. Strangely we feel we got to know you and them en route! I loved seeing my daughter’s photograph here and knowing her birthday as well as her untimely death was being celebrated. To know that so many people were remembered from across the world in one place is a warming thought. A connection and togetherness, brought about by rememberance and love. Day of the Dead is a special time that I know I will now mark each year, regardless of what country I am in. Such an interesting blog Jane….. It was truly amazing to be around you and Dad for a few days whilst you worked. Indeed it was so special to catch up with you in Mexico. Such twists of fate eh. Have to say that you and Rosa have been an inspiration to us in the way you have both openly courageously and positively grieved for your brother. for her support of our work and for taking time to talk to us about her work and our project. Jane and Jimmy are two remarkable people. I have no doubt that this film will be a wonderful way to honor Josh and to educate the world about one of the most painful experiences a person can have. I feel so fortunate to have met them and very much look forward to learning about the rest of their trip. 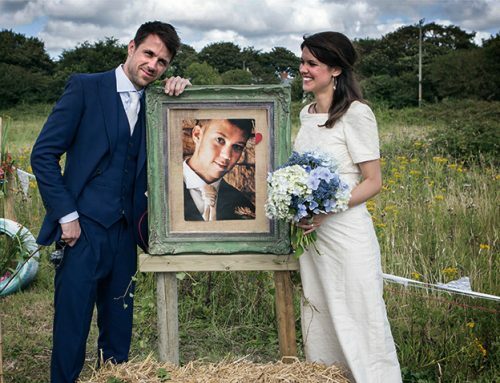 Dear Jane and Jimmy, your wonderful description of the ritual grieving of the two families moved me deeply as did the fact that they welcomed you both to grieve with them for their children and wanted to grieve with you for Josh and the other children whose pictures you took with you. Thank you Gina for your kind words. As you know better than most both as a parent who has experienced the death of not 1 but 2 of your children, and as a writer, the only way to go has to be trying to make some sense out of the pain and senseleasness that is child loss. I have always been a huge fan of your courage and capacity to do just that. Our trip has been amazing and now we are digesting and processing the whole experience. In Costa Rica before travelling back via Nicaragua and Guatamala etc. Great to read this as always dear Jane. What an incredible (and exhausting) experience this whole trip must have been and how special and apt to complete the filming in Mexico and be there for the Day of the Dead! Such moving stories and wonderful photos too . . . I just know that Josh would be so proud of all that you and Jimmy have done in his name. And it is so lovely that you took those other 30 children with you to celebrate and honour like that. You two are doing great pioneering work in bringing into the light what has been so often shut down in darkness. As you must know by now I think the world of you both and the powerful creative work that you are doing. 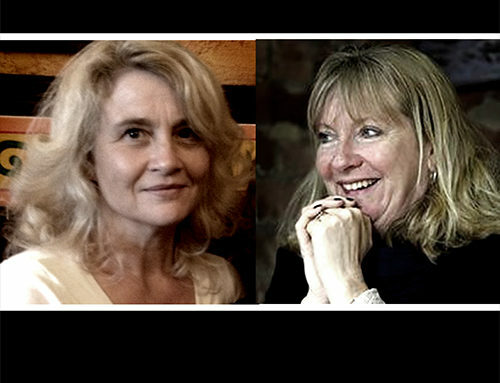 Dear Sally…..well we will just have to fly you over from Oz for the world premiere! 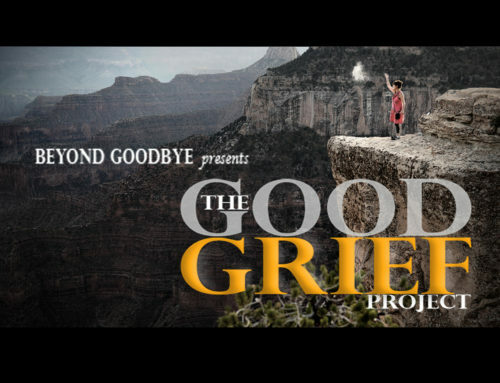 So glad to see this project coming along and looking forward to watching the documentary. My husband and I had skyped with you in late August/early September 2015 about being a part of the project but the timing wasn’t right for either of us. I hope this helped in your journey of grief and I know it will help others. I plan to share the website and video in my own social network because I think this is such an amazing project. As an update- we lost our daughter Charlotte when I was 5 months pregnant because of Preeclampsia but we were able to welcome a healthy baby boy, preeclampsia free, on 1/26/16. I miss my daughter everyday but I am so grateful for my son.